Two more animals just joined Steve Greig's very large and pretty amazing rescue family. Greig recently shared a photo on Instagram of Loretta the dog sitting in his car with not one but two baby chickens he'd saved from an animal swap last weekend, where people go to sell farm animals, with every intention of giving them a good forever home to live in - complete with a lot of canine siblings. 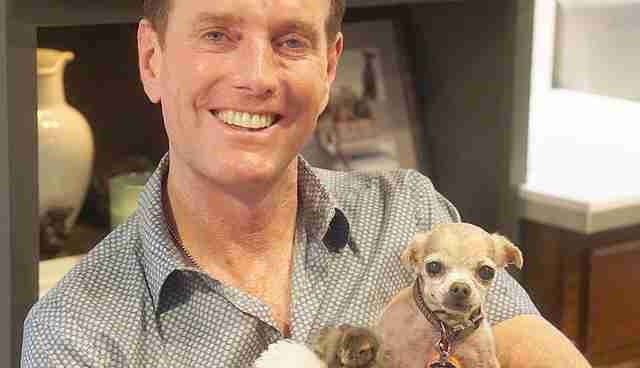 "I came across these baby Silkie chickens and couldn't resist," Greig told The Dodo. steve on Instagram: "So, Loretta and I went to the chicken swap this morning.....(I swapped some cash for these two)"
steve on Instagram: "No, it isn't pearls before swine. It's pearls placed on a pig with a purpose. Bikini is showing off her @wagaware pink charm to promote pig..."
... and Oprah, the Roomba-riding chicken, at an animal swap. steve on Instagram: "Enoch is a Wolfhound. 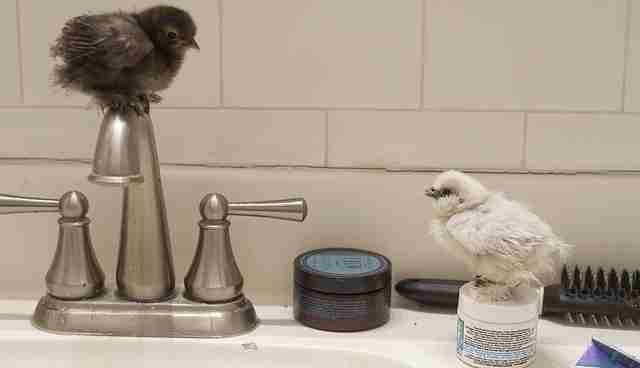 Not a Chickenhound or a Bunnyhound, so Oprah and Stuart are completely at ease...."
Greig named the darker chick Laverne, whom he described in an Instagram post as "slightly awkward" but more adventurous than the other chick, Shirley, who is smaller in size and quite the loudmouth. steve on Instagram: "One more with Loretta and the two new chicks who I named Laverne and Shirley. If you're under 40 you might not get the reference, but you..."
steve on Instagram: "If you're wondering why the quality of this picture is so much better than the stuff I normally post, its because I didn't take the..."
... and we have a feeling they're going to fit in just fine at their new home. steve on Instagram: ""And the lion shall lie with the lamb..." But until then, the dogs shall lie with the pig, who shall lie with the rabbit, who shall lie..."
"At this point they are too small to leave with my other chickens so they are living in the house for about a month or so," Greig said. " Next weekend I have to take a road trip and since they are too small to leave alone, they will be making the trip with me, ten dogs and Bikini the pig." 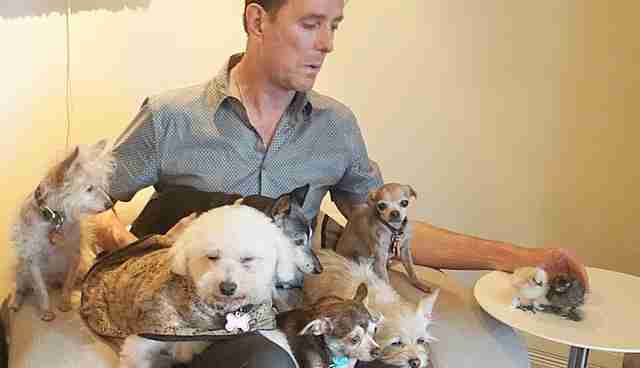 Click here to read more about Greig and his many rescue pets. steve on Instagram: "I thought giving them a bath all at the same time was a great idea. It was not. It was like being a lifeguard in charge of the baby pool..."
Keep up with Greig's "wolf gang" and their adventures on Instagram. steve on Instagram: "You know how you get frustrated when you go to a restaurant and you place your order and it seems to take forever to get your food? That's..."
Want to be an animal rescuer yourself? Get started at Adopt-a-Pet. steve on Instagram: "If my accounting career ever goes downhill I could always be a driver for one of those senior van companies that takes the elderly on their..."